Are you shopping for the best outdoor table? An outdoor table can be useful when you host outdoor parties, invite somebody over, or simply when you want to sit outside and enjoy the fresh air. However, buying a patio table can be confusing and overwhelming if you don't know what to look for. That's why I'm here to help. In this article, you'll learn about the different types of outdoor tables, reasons to buy one, considerations to ask yourself, features of outdoor tables, and our top pick for the best outdoor table. I've also given a chart of the top ten best outdoor tables on the market. I hope this article helps you when shopping for an outdoor table. Let's get started! In the chart below, you will find our top ten rated outdoor table options. For a more in-depth review of each model, please click on "Read Review." At a quick glance, outdoor tables may seem all the same. After all, all outdoor tables are meant to be used outside for eating and having parties. But when you take a closer look at each outdoor table, you will soon realize that there are many different types. From wood tables to glass tables to plastic tables, each type is unique and has its own features. 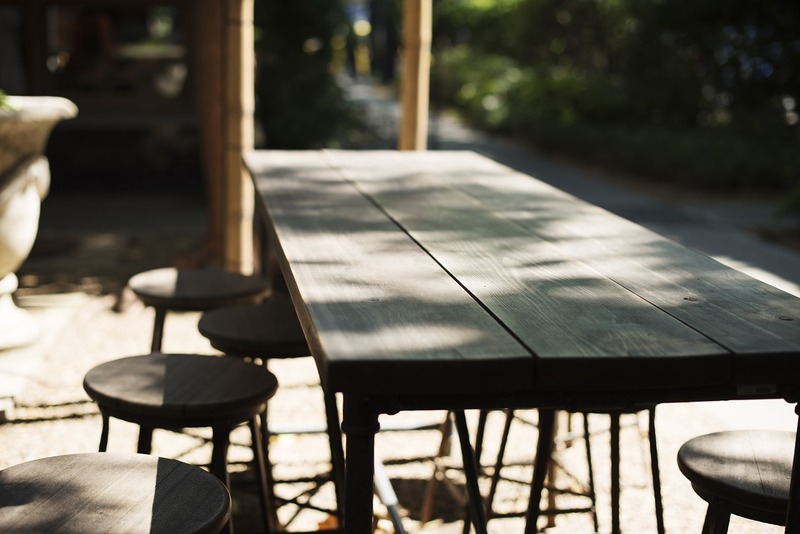 Let's take a few moments to look at the different types of outdoor tables. A folding patio table is perfect for when you need to travel somewhere with your outdoor table. Because it folds, you can easily pack it into your car without much of a fuss. It is also easy to store. You may even be able to find a plastic patio table with removable legs. Most folding tables are made with plastic and are therefore lightweight and easy to move around. Because they are made with plastic, outside folding tables are easier to clean since you can wipe down the entire table. It is much easier to clean than a wooden outdoor table because wooden tables have bolts that you have to clean around. With that said, after a while, a plastic outdoor folding table can get stains and marks that won't come out. If a wooden outdoor table got marks on it, you could easily paint or stain it. That is a nice feature that you can't do with outside folding tables. Next in line is the glass outdoor table, also called a glass garden table. Glass outdoor tables are much nicer looking than plastic outside patio tables. They are more expensive, but the higher price can be worth the beautiful look that it will add to your yard. Similar to plastic outdoor tables, you can easily clean a glass outdoor table by wiping it with a damp cloth. The main disadvantage of glass tables is that glass is not as durable as other materials such as wood. Although it is strong, it would still probably break if you had a hail storm. If your glass garden table did happen to break, it would be a safety hazard to you, your pets, your children, and anyone else that walked outside. Wood tables are very popular. Some wooden outdoor tables are foldable, but a lot are not foldable. A wooden backyard table can add a rustic look to your yard or porch, and it goes with almost any colored house. This type of outdoor table is great for outdoor events because it doesn't become too hot like aluminum and plastic can. A few disadvantages of wood outdoor patio tables is that it can be expensive, it can be more difficult to clean, and it can become damaged by the weather. Because the weather can damage a wood outdoor garden table, it is recommended to stain or paint it every once in a while. Many homeowners also choose to put their wood outdoor table indoors during the winter to protect it from the weather. An aluminum outdoor table is recommended for patios because it does not rust as other metals do. There are different treatments for aluminum, with powder coating being the most common. A powder-coated finish acts as a barrier against corrosion and helps prevent scratches. The only con about aluminum tables is that they can be expensive. Wicker furniture adds a nice look to a porch. That's why there is no wonder why people often choose wicker tables over other outdoor tables. Although wicker outdoor tables can look good by themselves, they look better when matched with wicker chairs. Because natural wicker does not do well in the weather, most outdoor wicker furniture is made of a synthetic material, either PVC or polyethylene, because of its durable and weatherproof qualities. This weatherproof version of wicker won’t fade over time, is lightweight, and is easy to clean. Keep in mind that wicker outdoor tables can be expensive. They can be especially expensive if you buy the whole furniture set, which would include the outdoor table and the chairs. A tile top outdoor table is a unique outdoor table that features tiles on the top of it. Although it is more expensive, a tile top patio dining table offers a rustic and creative look to your patio. Most tile top outdoor tables have permanent tiles, but you may be able to find a patio table with removable tiles. A tile outdoor table is a good option if you are wanting a rustic look. A round patio table, unlike a rectangle outdoor table, is circular. Its round shape makes it extra unique and great for smaller spaces. The round patio dining table can be made in any of the materials that I have listed above. There are many advantages and reasons for buying an outdoor table. Outdoor tables are perfect for when you host parties such as a backyard barbecue. They also add a nice look to your porch. Let's take a look at some reasons why an outdoor table may be the perfect addition to your porch. Sit back and enjoy the fresh air - With an outdoor table, you can sit outside during the summer and fall days and enjoy the fresh air. You may find that you enjoy eating your breakfast on your porch instead of inside. Or perhaps you want to read a book outside. Whatever the case may be, it is made possible because of an outdoor table. Perfect for parties and events - As I have already mentioned, an outdoor table is perfect for parties and events. Not only is it great for parties in your backyard, but most outdoor tables can easily be traveled with if you will be needing them somewhere else, such as at a wedding. Great for your outdoor kitchen - An outdoor table is perfect for your outdoor kitchen. It makes a great dining table for when you want to eat outside. There are many considerations that you should ask yourself when you are buying an outdoor table. By asking yourself these questions, you can determine which type will fit your needs the best. To help you get started, I've included a list of considerations to ask yourself when buying an outdoor table. This is a very important consideration to ask yourself. If your deck or patio is very narrow, you will need a narrow patio table. If your patio is large, you may be able to use a large patio table. Before you buy a porch table, make sure you measure your porch so that you know how much space you have. Make sure you leave enough room for you to be able to walk around the table. To be safe, it is always better to go with a smaller outdoor table so that you have enough room to walk around. You may be surprised at how much room even a small patio table can take up. Therefore, don't go with an outside table that is any bigger than you need. Next, consider what the weather is like at your house. Although all of these tables are rated for outdoor weather, some are not as durable as others. For example, wicker outdoor tables may not be a good option if you get a lot of moisture. If where you live is windy, an aluminum patio table may blow around. Hail will damage glass outdoor tables, and heat can cause aluminum tables to be too hot to touch. Consider what your weather is like before you purchase an outdoor table. Where Will You Put Your Outdoor Table? The next consideration is this: Where will you put the outdoor table? Not only does this question help you decide where you will put it, but it also helps you determine which type will fit your needs the best. Will you be putting it under a roofed patio? Or will it be on your deck that is exposed to the weather? Similar to the last consideration, you will need to ask yourself what the weather will be like where the outdoor table will be. What Style Do You Like the Best? Although it is important to consider the durability of each outdoor table, it is also important that you consider which look you like the best. Some people like wooden outdoor tables because they have a rustic look. Others like the color of aluminum, while yet others prefer glass outdoor tables. Consider which style you like the best. Provides an outdoor environment to eat, drink or do activities at. Can help to make your yard look nicer. They may wear longer if exposed to the elements. Birds and other wildlife may make them unclean. They can get blown away if not anchored down. Outdoor tables have many features. From being foldable to featuring caster wheels, there are so many unique features that each type of outdoor table has. Let's take a look at those features here. The first feature that a lot of outdoor tables have is their foldability. This allows you to easily travel with it and store it. Keep in mind that not all outdoor tables have this feature, but a lot do. Unlike indoor furniture, outdoor tables can withstand the weather outdoors. Keep in mind that rain, snow, and hail can still damage it, but overall they are durable and strong. You may be able to find a patio table with wheels. What's nice about this is that you can easily transport it. It is easy to roll, and it is not as heavy as it would be if you had to pick up the table. If you are wanting an umbrella to shade you from the sun, you may want to consider buying a foldable patio table with an umbrella hole. This allows you to attach an umbrella to it. Our top pick for the best outdoor table is the Lifetime Adjustable Folding Utility Table. This outdoor table is a plastic foldable table at an inexpensive price. It features three adjustable height settings and has a convenient carry handle. This outdoor table is lightweight, which makes it easy to carry. Overall, this outdoor table received positive reviews. I hope you found this article to be helpful. 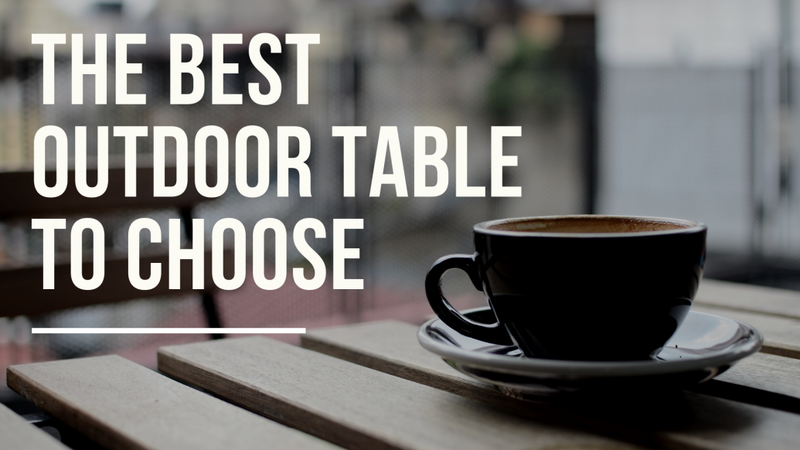 In this article, I went over the top ten best rated outdoor tables, as well as the different types of outdoor tables, reasons to buy one, considerations to ask yourself when buying one, features that outdoor tables have, and our top pick for the best outdoor table. I hope you find an outdoor table that fits your needs. Your porch will become a nice place to hang out at when you add your outdoor table and outdoor chairs to it.